Earlier this month, the CCPA released The Best and Worst Places to be a Woman in Canada report. Kingston took the top spot in this year’s rankings with the smallest gender gap between men and women, while Barrie ranked last. The Beaverton had another take: while Kingston might well be the best, surely the Trudeau cabinet was the worst place to be a woman in Canada. Of the many issues raised by the SNC-Lavalin controversy, the obstacles that women face at decision-making tables are depressingly familiar. Our report shows that the biggest gender gap nationally and at the local level is in leadership. Women are more likely to vote in local elections but make up only one-third of city councillors and only one-fifth of mayors. The Trudeau government made history by bringing in Canada’s first gender-balanced federal cabinet in 2015—but a meaningful feminist agenda demands more. It demands bold action and sustained funding to achieve meaningful change in the lives of women and girls. Last year’s budget, billed as the Gender Equality Budget, delivered on proactive pay equity legislation for federally-regulated sectors, gender-based budgeting, and elevated Status of Women Canada to a full department with a new intersectional mandate. Funding was set aside to assist small enterprises led by women, and women seeking to enter the trades. A new “use it or lose it” parental leave was introduced to encourage uptake by second caregivers (usually fathers). These programs have an important role to play in helping to tackle Canada’s gender pay gap, one of the largest in the OECD, ranking 30th out of 36 countries behind all European countries and the United States. But without the swift implementation of the 2018 Pay Equity Act, including significant investment in training and education, compliance and enforcement, it will be more than a decade before women see any change in their pay cheques. 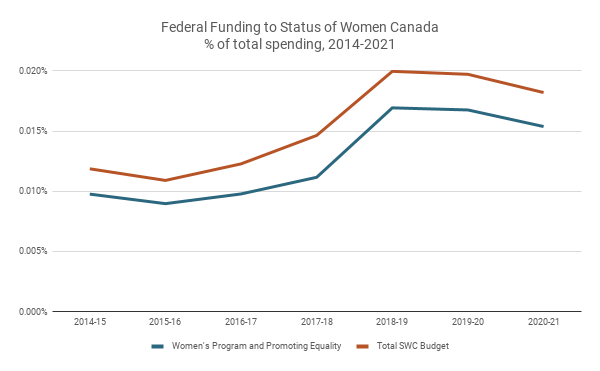 Budget 2018 also increased funding for Status of Women Canada (now Women and Gender Equality Canada) and the Women’s Program. This past week, Minister Monsef announced support for 250 projects that will increase the capacity of women’s and Indigenous organizations to advance gender equality and serve the needs of their communities. These new resources represent significant progress but the departmental budget still amounts to less than two one-hundredths of one percent (0.017%) of total federal spending. There is a clear gap here—between language and delivery. Women’s Economic Empowerment: Invest in the sectors where women work today, ensuring that job stimulus and infrastructure spending is directed at Canada’s entire labour force. Raising wages in highly feminized occupations and industries would not only help to narrow the gender pay gap directly, but would also help to reduce occupational segregation by attracting more men into fields like education and health, boosting GDP in the process. Education and Training: Provide tailored supports and training for women (including more generous aid for lower-income students) who face employment barriers or work part-time involuntarily. Better recognition of the qualifications of women who have been out of the workforce caring for children and family members is also needed. Pay Equity: Increase resources to ensure the swift implementation of the 2018 Pay Equity Act, upholding existing human rights protections, and including support for effective training and education, compliance and enforcement and provisions for pay transparency. Child Care: Invest in universally accessible, affordable, inclusive, high quality child care and introduce paid paternity leave, building on the success of the Quebec model. The federal government’s current 10-year funding commitment for child care will leave Canada in last place in the OECD—far short of its recommended benchmark of 1% of GDP. Income Security Reform: Tackle the gender bias in income security programs such as Employment Insurance, Seniors Benefits, and the Canada Workers Benefit that undercut women’s economic security and reproduce disadvantage, by ensuring equitable access and enhancing the support on offer (e.g., instituting a lower uniform entry requirement for EI benefits, bringing back the “drop out” provisions that allowed caregivers to exclude months of zero- or low-income in the calculation of their CPP benefits). A National Plan for Violence against Women: Invest in a fully-resourced National Action Plan to address Violence against Women, based on the Blueprint for a National Action Plan, taking recommendations from the National Inquiry into Missing and Murdered Indigenous Women into account. The Action Plan should address the structural factors that causing inequality and violence and include targets, timelines, and the resources necessary for implementation. Progressive Tax Reform: Focus on revenue generation and stability in federal revenues through progressive tax reforms, eliminating wasteful and regressive tax loopholes and expenditures as well as those that overwhelming benefit wealthy Canadians and corporations, exacerbating inequality. Men capture the majority of the benefit from these tax breaks as well. Right now, 62 cents of every dollar in tax breaks flow to men. Women and girls lose out from the cumulative impact of these policies, first when they lose access to essential public services, and secondly, when they are forced the fill the gaps with many hours of unpaid caring work. Women are still waiting for meaningful change in communities across the country. Years of effort to remove entrenched economic, cultural and social barriers to women’s progress are not landing the results we all expected by now. We will be watching on Budget Day (March 19th) to see whether the government follows through with the resources needed to deliver on their promises of making Canada a more equitable place for women. Check out the Canadian Centre for Policy Alternatives Alternative Federal Budget 2019 for our detailed recommendations for Budget 2019. Katherine Scott is a Senior Economist with the Canadian Centre for Policy Alternatives. Follow her on Twitter @ScottKatherineJ. • Taking Stock of the Government’s Feminist Policy Agenda: Where to next? • Why Should Alberta Implement Pay Equity Legislation? Because it’s 2016. Glad I’m in Calgary, its pretty great being a woman here in my opinion.